Underground development at Ivanhoe’s Kamoa-Kakula mining complex in the Democratic Republic of Congo. Source: Ivanhoe Mines Ltd.
Ivanhoe Mines Ltd. [IVN-TSX; IVPAF-OTC] Chairman Robert Friedland says the company’s Kamoa-Kakula mining complex in the Democratic Republic of Congo is set to become one of the world’s greatest copper mines. Peak annual production is expected to exceed 700,000 tonnes. Friedland made the comment after Ivanhoe released the results of an independent prefeasibility study (PFS) as well as an expanded preliminary economic assessment (PEA) for the Kamoa-Kakula complex. “These studies clearly prove our long-standing conviction that Kamoa-Kakula is firmly on track to become one of the absolute greatest copper mining complexes in the world, helping to restore Katanga’s rightful position as the world’s largest copper producing region,” Friedland said during a keynote address to the 25th annual Mining Indaba. The Kamoa North prospect area is located on the 397 km2 Kamoa-Kakula mining license which is situated 25 km west of Kolwezi. A mineral resource estimate released in February, 2018 states that Kamoa-Kakula contains an indicated mineral resource of 1.03 billion tonnes at 3.17% copper, or 72 billion pounds of copper, plus an additional 182 million tonnes of inferred mineral resources at 2.31% copper at a 1.5% cut-off. That makes Kamoa-Kakula the world’s fourth-largest copper discovery. The copper grades are the highest, by a wide margin, of the world’s top 10 copper deposits. The tier-one Kamoa-Kakula Project is a joint venture between Ivanhoe Mines, China’s Zijin Mining, and the DRC government. The Stage One, 6 million-tonne-per annum operation at Kakula with an estimated development capital of US$1.1 billion, is expected to yield an after-tax net present value (NPV) 8% of US$5.4 billion and an Internal Rate of Return of 47% over the 25-year mine life. 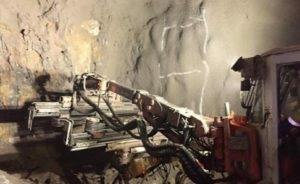 The Kakula Mine’s first stage will average 6.8% copper over the first five years, with mine-site cash costs of US$0.43 per pound. The updated PEA envisions an expanded Kakula-Kamoa production rate of 18 million tonnes, supplied initially by a 6 million tonne-per-year mine at Kakula, followed by two 6 million tonne-per year mines at Kansoko and Kakula West [areas] and a world-scale direct-to-blister smelter. The PEA foresees staged mine expansions. The smelter will be funded from internal cash flows and yield an after tax NPV8% of US$10 billion and an IRR of 41%, Ivanhoe said. Once the expanded PEA production rate of 18 million tonnes per annum is achieved, Kamoa-Kakula is projected to become the world’s second largest copper mine, with peak annual production of more than 700,000 tonnes of copper. Ivanhoe shares rallied on the news, rising 13.79% or $0.40 to $3.30 on volume of 2.15 million. The 52-week range is $3.59 and $2.00.